”It feels like we’re playing at home, so it was a good atmosphere for us,” Kristaps Porzingis said. 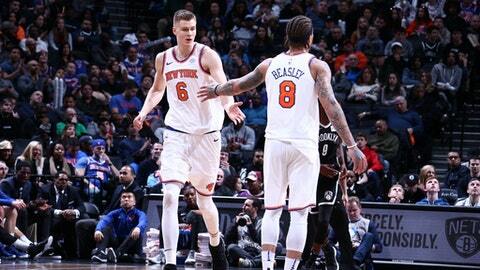 ”I think it’s the beginning of an opportunity and they came out and responded after yesterday’s loss,” Knicks coach Jeff Hornacek said. ”To a certain extent, it’s a make-or-miss league. As a unit, we shot in the 30s. That’s not very good,” said point guard Spencer Dinwiddie, who went 2 for 14. ”They took us out the beginning of that fourth quarter and then dominated us the rest of the quarter,” Nets coach Kenny Atkinson said. Knicks: Trey Burke made his Knicks debut after being signed Sunday from their G League team. Burke made a jumper on his first shot and had five points. … Hornacek said Hardaway hadn’t had any setbacks or recurrence of injury, but that he needed rest after playing more minutes than they’d planned on Sunday. Nets: The Nets fell to 0-8 against the Atlantic Division. … D’Angelo Russell practiced with the Long Island Nets of the G League on Monday as he continues his recovery from left knee surgery. He was recalled after practice and sat on the Nets’ bench, where he was called for a technical foul in the third quarter. Atkinson said the point guard is close to returning from the injury that’s sidelined him for two months. … C Tyler Zeller was back in the starting lineup after missing a game with a sore left hip.